Hurricane preparedness is a tough job. This past weekend, many Americans got ready for Hermine, securing their outdoor furniture, boarding up their windows, and re-upping on batteries and bottled water. 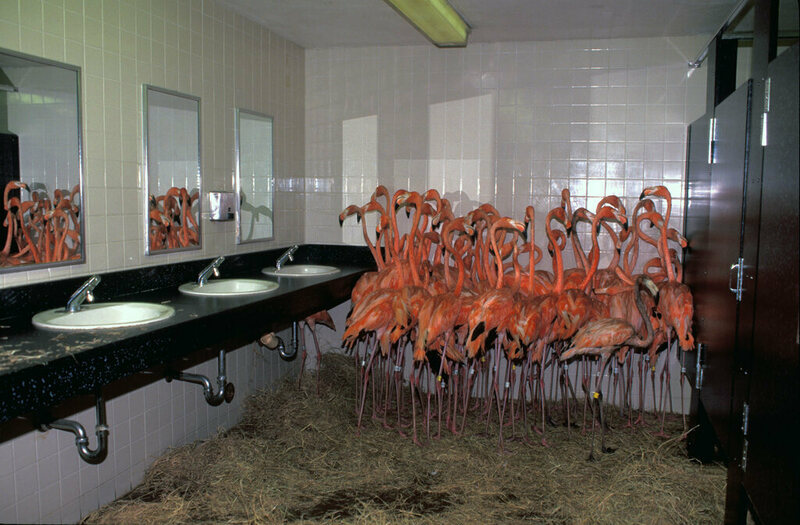 But odds are that very few people had to stuff 30 flamingos in the bathroom of the Miami Metrozoo. Back in 1992, in the leadup to Hurricane Andrew, Ron Magill of Miami, Florida found himself with two to-do lists. First, he had to prep his own home, where he and his wife (who was eight months pregnant) would ride out the storm together. Second, he had to help get an entire zoo ready for disaster. Magill, then the zoo’s assistant curator, was skeptical. He had been working there for 12 years, and all the past hurricane threats—Alberto, Bob, Floyd—had come to nothing. When Andrew suddenly loomed, “I’m thinking to myself, my gosh, this is garbage,” he says now. “I thought we were doing all this for nothing.” But he and his team ran around doing what they could, making sure all of their furry, feathery and scaly charges were securely housed and fed. Some of the bird exhibits weren’t likely to live up to the task. Most days, the flamingos loved being outside, sunning themselves in their outdoor lake. But a Category 5 storm promised to be somewhat less relaxing. As soon as they were sure Andrew would make landfall, Magill and the other keepers looked for somewhere else to put them. Across the country, journalists were looking for new ways to get the extent of the devastation across. “Everyone was saying, ‘Does anybody have anything different than your basic stuff—trees down, roofs off and people with their bathtubs in the front yard?’” remembers Magill. He sent out his bemused flamingos. The image was picked up by local newspapers and, soon, national ones, and the birds became the feathery face of the storm.